With replacing the modern heart of the home costing around $8000, you may be hunting for alternative avenues to update your kitchen without breaking the bank. Once you have an interior style in mind, such as Scandinavian, traditional cottage, or a modern rustic design, you can begin your quest for searching for the best ways to create this look by using the three following tips, equipped with a few ideas on how to update your kitchen furniture on a budget. If your kitchen cupboards are a little worn and dull, you may consider purchasing some cheap kitchen cabinets. With an abundance of online cabinet stores, you’re spoilt for options at an affordable price, as buying online helps to keep the cost low. For the kitchen cupboard doors, if replacing them isn’t a financially viable option, you could try repainting the front of the door alone to update and refresh your kitchen. With a variety of easy to use furniture paint available in store and online in an array of colors, there is sure to be something to your liking to fit your desired interior design goal. Another drastic budget-friendly option for updating your kitchen furniture could be to replace the kitchen worktop. However, bear in mind, when you are shopping for a new kitchen surface, it must be in sync with the style of your kitchen cupboards. For example, purchasing an oak rustic worktop might clash with mahogany colored kitchen cupboard doors. If you’ve set your eyes and heart on a specific worktop, take some time and effort to think about revisiting and using the points above to transform your kitchen cupboards to work in harmony with your new surface. With most kitchen spaces being open plan, a dining area is usually an integral necessity for playing host to dinner parties and family meals. 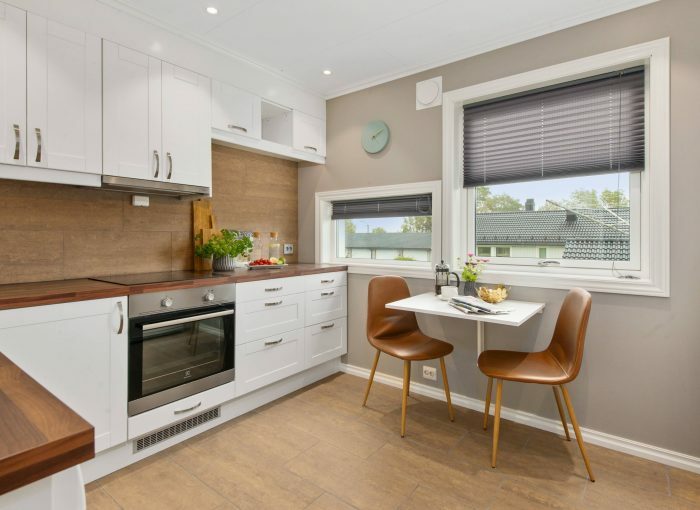 Following updating your cabinets and cupboard doors, the dining set may be lacking somewhat in the style and sophistication your spruced up kitchen cupboards emulate. However fear not, you have a few budget-friendly furniture options at hand. You could either invest in second-hand furniture from sites such as Craigslist, Shpock and eBay to save on the amount you would pay for brand new furniture. Or alternatively, you could update your existing set by investing some time into transforming your dining piece. This could mean using furniture paint or sanding back an all wood dining site and revarnishing. This will help to revert it back to the appearance it once help when you first bought it. Beyond experimenting with different kitchen furniture colors, textures and materials to update your kitchen on a budget, you may begin to focus your attention on other areas of the kitchen that may be lacking since your kitchen furniture update. This means elements such as the wall paint and flooring may also need some of your DIY interior design attention to ensure the look of your kitchen is in sync.